What a difference an artistic team can make! Scott Snyder redefined Swamp Thing for a new audience, but writer Charles Soule lacks the same panache, instead delivering an issue that is out of character, unfocused and slow. Where Swamp Thing goes wrong is in its narrative. Scott Snyder gave Alec Holland a regal quality, his internal voice acting as a guidepost for the level of sophistication readers were encountering. Charles Soule, instead, evokes the demeanor of a 15-year-old when dipping into Alec Holland’s mind. He makes abstract connections between popular culture and his own life. He plays dumb with a villain only to actually be dumb when the villain confronts him. And he somehow ends up in Metropolis with a villain from Gotham. Furthermore, the issue lacks the seriousness of previous arcs. Alec’s voice reads 10 years younger (at least), and his naiveté is opposite of the experience and exposure he would have carried with him through “Rotworld.” While he has a few new tricks – like being able to transport from place to place using nature as his shuttle – he’s cold and vicious, attacking crops and destroying peoples’ livelihoods, despite their importance to general commerce. Additionally, Kano is no Yanick Paquette. His work is serviceable, but where Paquette created elaborate panel borders, Kano only attempts to imitate his style. He eschews the cleverness of the illustrative flow of the comic for broken and splintered panels, none of which really stand out. Everything is just okay, but nothing has as much punch as the previous art of the book. To be fair, I like the idea of Alec calling upon Superman to help him defeat a villain. 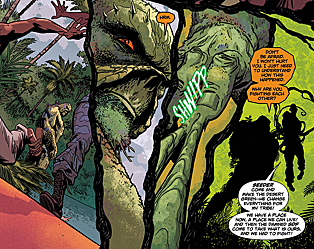 This confrontation is only teased, though, and I don’t think I’d shell out the money for another issue of Swamp Thing. Sadly, I think the green guy’s resurgence has met a quick end. Unless DC can find another creative team with as much spark as Snyder and Paquette, I don’t see Swamp Thing being the title it was two months ago. 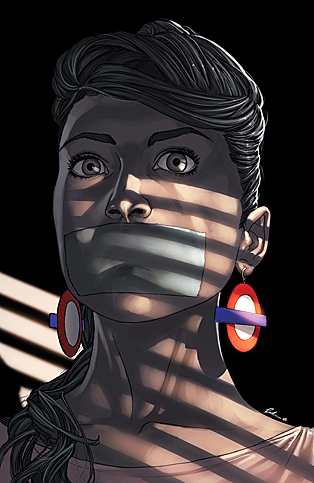 Writer Jim McCann starts Mind the Gap with a warning, telling readers that the issue is meant to be silent, focusing on the story of intersecting characters and how their tales play out in the larger scheme of the comic. He also gives a caveat, praising his artists for their work before diving back into the past to reveal how the lead character came to be in the first page. What he writes, however, is a barely discernible story, partly due to its own chaotic pace and partly due to the art. Dan McDaid’s art is interesting, but too garish a shift from Rodin Esquejo, making the comic a visually difficult read. Using subdued color palettes and blocky, shadowed figures, Dan McDaid reveals a bit more about the dark history of the lead characters. But without the clean and impressive art stylings of Rodin Esquejo, the characters lack any real discernibility, and it’s hard to tell whose story is actually being followed. Even the violent, gothic end fails to hit home due to the abstract art design. When coming away from a book like Mind the Gap #9, one can’t help but feel cheated in that the major event that was teased in previous issues failed to have any lasting impact on the rest of the series (or so it would seem). I can only hope that Mind the Gap rebounds, delivering the kind of magical story that made Image a force to reckoned with. Bannen’s Book of the Week: After Grant Morrison’s departure, I wondered how DC could keep readers interested in a series like Action Comics. 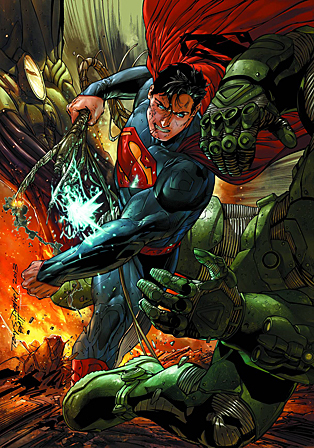 Thankfully, Andy Diggle takes over writing the flagship comic for Superman fans, delivering a first issue that hits upon all the important aspects of the character while still carving its own niche in the Superman universe. Much of the comic is exposition for future stories, but it’s packed with action and character moments, both of which help to define Superman beyond the quirky, poorly paced and eclectically constructed stories of Grant Morrison. In his turn writing Action Comics, Andy Diggle goes to a few new areas with Superman, instead giving the story an earthly, grounded feeling with more sinister moments than the previous issues combined. I’m speaking particularly of Lex Luthor, who steals the show in his few but glorious scenes in the comic. His plan to destroy Superman may come to fruition eventually, perhaps in darker ways than one previously assumed. Plus, Tony Daniel creates some great shots of our hero, and coupled with Tomeu Morey’s colors, some of the imagery has real vibrancy and style, more so than what’s previously been seen in Action Comics. Daniel’s Superman is intimidating and fierce, much more akin to the Jim Lee Superman of Jeph Loeb’s “Hush” rather than the everyday hero found in Rags Morales’ work on the title. 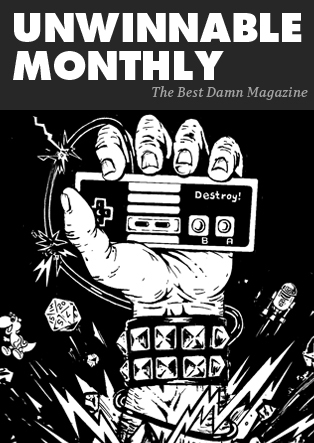 Andy Diggle offers readers a promising introduction, and I’m excited to see how he picks up the imposing mantle of Grant Morrison (who has a tendency to deliver grand, if fragmented stories that stretch the readers’ imaginations). Diggle has a more straightforward approach, and I’m hopeful to see what is going to occur in the pages of Action Comics.